The J. C. Beaglehole Room of the Victoria University of Wellington Library has launched two new online archival resources which provide many insights into trade union and political activity from the 1970s to the 1990s. The Dan Long Union Library Poster Collection and the Therese O’Connell Poster Collection offer a unique opportunity to examine digital images of over 400 posters created during the last 50 years by trade union, protest organisations, government departments and other groups from New Zealand and overseas. They complement another online J.C. Beaglehole Room collection of music and cultural posters from the New Zealand Student Arts Council archives. “Posters are a powerful and ubiquitous medium of visual communication, yet individual examples usually only spend a short time in the public eye,” says JC Beaglehole Room Special Collections Librarian, Sue Hirst. The collections include posters published by groups like the New Zealand Public Service Association, New Zealand Council of Trade Unions, and International Labour Organisation, promoting the cause of trade unionism and taking positions on important issues of the day. Some are government posters which document issues such as changing approaches to workplace safety. Other posters were created within protest movements opposing the Vietnam War, the 1981 Springbok rugby tour, and nuclear testing in the Pacific. Feminist and abortion rights groups are also well-represented. 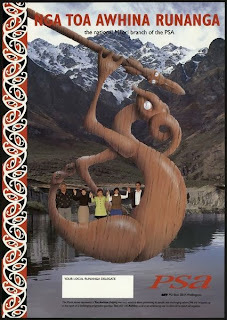 The Dan Long Union Library Poster Collection was part of a large donation of research materials made by the New Zealand Public Service Association (PSA) in 1999. 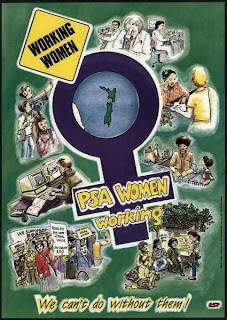 Most of the posters were originally collected by veteran trade unionist and activist Therese O’Connell (MNZM). In 2010, she donated around 60 examples to the Victoria University Library, which are now the Therese O’Connell Poster Collection. Sue says the launch of the online collections is timely in several respects. Over 50 of the posters were designed by the Wellington Media Collective, the subject of a book recently published by Victoria University Press, We will work with you: Wellington Media Collective 1978-1998 (2013). It also coincides with events being held this year to celebrate the centenary of the New Zealand Public Service Association. “We are grateful for the support of the Dan Long Trust, which enabled us to carry out the digitisation of the posters and development of the online resources during 2013,” says Sue. The resources will be available online from 27 September.